I am one of those people who cannot resist a bargain. Tell me something is half price and I have to buy it. Because even if I didn’t need it before I certainly need it now. That’s how these Mars cookies came to be. I’d bought a stash of Mars bars on special and had inconveniently forgotten about them. I couldn’t let them go past their best before date, that would be a crime against chocolate, so I started to wonder what I could do with them, and I had to wonder fast! My love of Mars bars goes way back. From high school onwards, a Mars bar has been my go-to pre-exam breakfast and it’s never let me down yet! I was going to whip up a batch of the Mars Bar Brownies, because YUM but all I could think about was cookies. So cookies it was. These are about as close to cookie perfection as I have ever got, they’re soft, pillowy, chewy and full of nougaty, caramelly, marsy (I just totally made up a word,) goodness. Of course, I added some fudge pieces because everything is better fudge, even Mars Bar Cookies and I also added some oats on the assumption that because these cookies have oats they’re basically a health food! 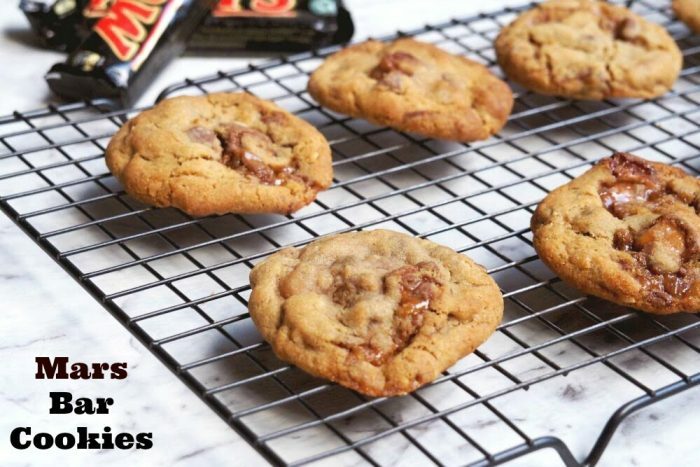 The best thing about these cookies is that they’re a doddle to make, and although patience is required while the dough is chilling, once it’s done, the dough can be stored for up to 5 days in the fridge and up to 3 months in the freezer which means you can have freshly baked cookies whenever you want or need them. And let’s face it, when it comes to cookies, isn’t want and need basically the same? If all that wasn’t yummy enough, baked cookies can be frozen too. 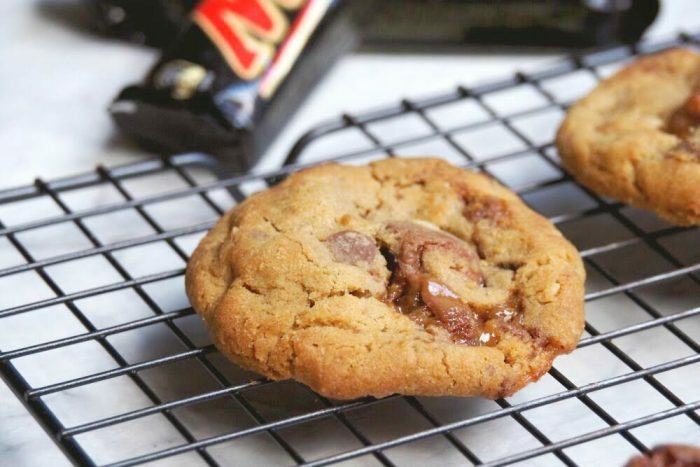 I like to strategically place the Mars bar pieces on the top and sides of the cookies rather than the bottoms, because a) it looks better and b) the caramelly goodness is not sizzling directly on the baking tray (what a waste that would be!) The trick with these cookies is not to overcook them. 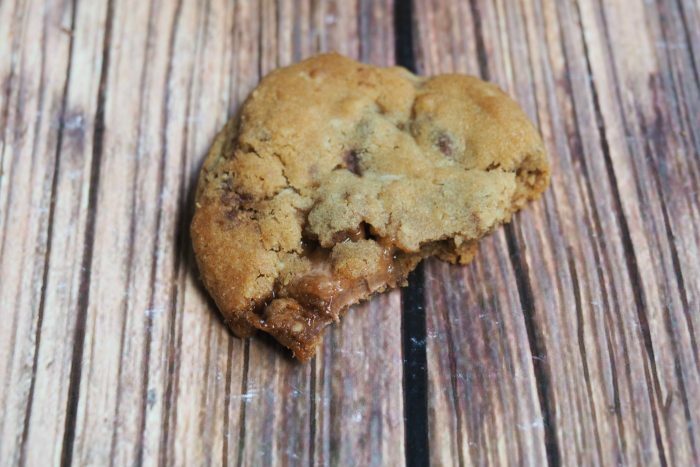 Baking for 10 minutes or more is right up there with cookie baking sins, just don’t do it! I promise you, even the cookies look a bit underbaked when you take them out, they will firm up to perfection on cooling. You can firm up a soft cookie but you can’t soften a tough cookie, ain’t that the truth? Scrape down sides of the bowl and add the flour, cornflour, bicarb and salt and mix for a further minute or so. Gently fold in the oats, Mars bar chunks, fudge and choc chips. Scoop tablespoons of dough into balls and place on a large plate, then gently flatten them with the palm of your hand. Cover with plastic wrap and refrigerate for a minimum of 2 hours but overnight is best. Place the cookie mounds on the baking trays making sure that they are really well spaced (about 5cm) as the cookies spread as they bake. I can fit 6-8 cookies on one tray, and usually bake the dough in 2 batches. Bake for about 8-9 minutes, turning the tray half way through. Don’t be tempted to bake the cookies for longer, they’ll firm up on the tray. Cool on the baking trays for 5 minutes, then lift onto racks and leave to cool completely. Cookies can be stored in an airtight container at room temperature for up to 1 week, or in the freezer for up to 3 months. Unbaked cookie dough can be stored airtight in the fridge for up to 5 days, so you can bake fresh cookies whenever you want or need (isn’t that the same thing?) them?! Add the butter, and sugars to TM bowl and mix on speed 4 for 1 minute. Add the vanilla to TM bowl. With the blades running on speed 3, add the egg through the hole in the top of the lid. This should take about 30 seconds. Add the flour, cornflour, bicarb and salt . Set the dial to the closed lid position and knead for 30 seconds on interval speed. Add the oats, chopped Mars bars, choc chips and fudge and mix on reverse speed 3 for 20 seconds using the spatula to assist. When you are ready to bake the cookies, remove from the fridge to rest at room temperature for 15 minutes and heat oven to 180C/fan 160C. Line two baking trays with baking paper.